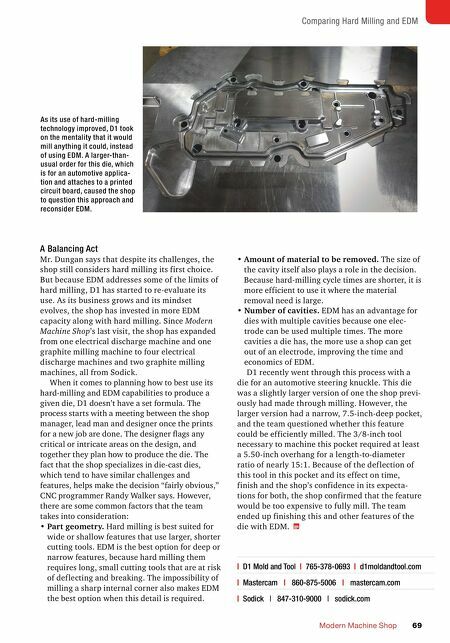 MMS JUNE 2018 68 mmsonline.com DIE/MOLD MACHINING The Limits of Hard Milling Many of hard milling's difficulties come down to its unpredictable timing, Mr. Dungan says. D1 uses its CAM software's Dynamic Milling to create tool paths that use the cutting tool's full f lute length to maximize material removal and mini- mize tool wear when cutting hard steel. This tool- path generation feature takes the geometry of the tool engagement into consideration to keep forces constant, potentially resulting in tool paths with additional turns and directional changes to keep engagement from significantly changing. However, because it can't narrowly predict how a machine will accelerate and decelerate through these directional changes, cycle time estimates are approximate. Further increasing the uncertainty, the shop also runs "flex paths" on its dies to address cutting tool deflection. If the features of a hard-milled cavity are not in tolerance because of tool deflec- tion, the machinist repeats the cycle until they are. Mr. Dungan says that the shop has run flex- path cycles as many as four times on some dies. It is impossible to predict how much of this re-run- ning will be needed. "Unpredictability is costly," he points out. Not knowing how long the process will take complicates timelines and scheduling. Surface finish is another challenge, he says. Cutting tool deflection, especially in dies with narrow or deep features, affects the finish of hard- milled dies. This means that these dies spend more time at D1's in-house polishing area. All dies are run through the company's polishing department to ensure that the parts will release from the cavity impressions. Mr. Dungan says that basic dies can be polished in just a few hours, but dies with more complex geometries might require 12 hours or more. With EDM, the finish is generally better, but also more consistent, which is just as valuable for controlling polishing time. Finally, broken cutting tools are a concern. Longer, narrower cutting tools are at risk of breaking when machining deeper features. D1's shop manager, Mark Whybrew, described making a die that had four ribs. Four cutting tools broke when machining each rib, resulting in a total of 16 broken tools. The cost of this can be a factor in determining whether hard milling makes sense for a given die, and dealing with broken tools also contributes to hard milling's unpredictable timing. The Benefits of EDM Meanwhile, one of EDM's major advantages is its predictability, Mr. Dungan says. Even though the process of machining an electrode and burning a feature through EDM might take longer than hard milling it, time estimates of EDM processes are more accurate than those of hard-milling processes. Sometimes the longer cycle time is worth the trade-off because predictability makes scheduling easier. The increased predictability also applies to quality. Because the finish from EDM is more controllable and consistent, polishing time is also easier to predict. In addition, advances in the shop's milling technology serve EDM as much as hard milling. As the graphite milling process used to make EDM electrodes improves, time savings and surface-finish quality increase. Through efficient machining cycles, graphite electrodes increas- ingly can be made in a single piece, instead of having to be broken into multiple sections that need to be blended together after machining. 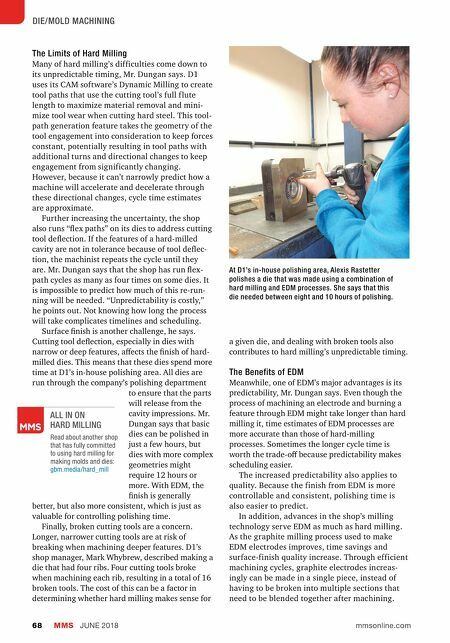 Read about another shop that has fully committed to using hard milling for making molds and dies: gbm.media/hard_mill ALL IN ON HARD MILLING At D1's in-house polishing area, Alexis Rastetter polishes a die that was made using a combination of hard milling and EDM processes. She says that this die needed between eight and 10 hours of polishing.